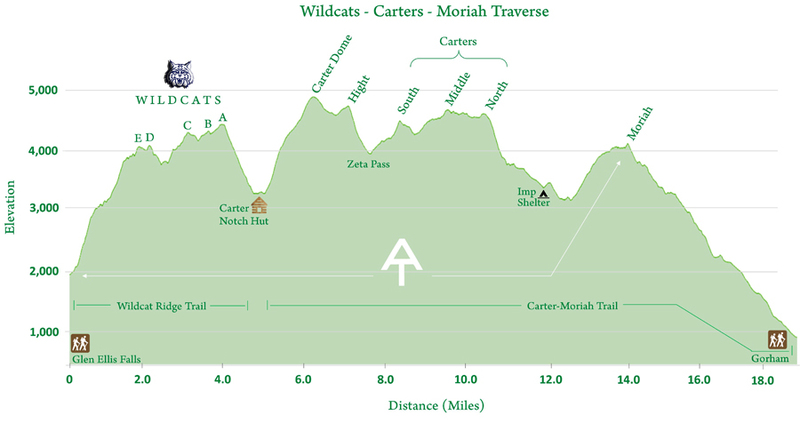 - On Tuesday morning I headed to Pinkham Notch early in the morning to run one of the more rugged traverses in the White Mountains, Wildcats-Carters-Moriah. Although it doesn't get the same recognition as the Presidential Range across the notch, it's on par with a Presi Traverse as far as difficulty. While the WCM doesn't have the above treeline weather experience and the cautions that come with that, it makes up for it with some of the steeper sections of trails in the White Mountains, Wildcat Ridge Trail from Pinkham and Carter notches, and the Carter-Moriah Trail from Carter Notch and north of North Carter. - My plan for the run was to start at 6AM and finish by noon, I'd start out with a moderate/aggressive pace over Wildcat Ridge to Carter Notch and keep this pace until climbing back out of the notch to the summit of Carter Dome, where I would then up the tempo to a sustained aggressive pace. - The beginning of the route starts off with a relentlessly steep climb from Glen Ellis Falls to the top of Wildcat Ridge where a series of 'hogbacks' AKA PUDs travels over the summits of Wildcat E, D, C, B, A Peaks. - The footing is gnarly as the trail quickly gains elevation, odd sized boulders with some rock steps and some mini scrambles make up the first mile. Along the trail there are a few great outlooks with tremendous views down into and across the notch of Mount Washington and its ravines. - Once gaining the top of the ridge the trail becomes a little easier to navigate with smaller rocks and roots with dirt. Wildcat E Peak is reached first followed shortly by Wildcat D Peak with a small col in between which doubles as the top of the Wildcat Ski Area gondola lift. After D Peak the Wildcat Ridge Trail continues up and down through the hogbacks past C, B, and A Peaks. After Wildcat A Peak the trail descends steeply over very rugged terrain until bottoming out at Carter Notch. - I reached Carter Notch Hut about 2.5 hours into my run, here I refueled and took a ten minute break before starting the steep climb back out of the notch to the summit of Carter Dome. - For the rest of my run I would be traversing the entire length of the Carter-Moriah Trail. While the first mile is a steep climb up to Carter Dome's summit, the footing is much better compared to the Wildcat Ridge Trail so it's easier to maintain a solid hiking pace. Carter Dome's summit has a small clearing where an old firetower used to be but there are no views so I continued on my way over to the next peak, Mount Hight, which has tremendous views of the Wild River Wilderness and the Presidential Range. - The drop down from Mount Hight is a rough and steep one, but it's only 0.4 miles in length so it goes by quickly. Soon after connecting with the part of the Carter Dome Trail that coincides with the Carter-Moriah Trail, the Zeta Pass is reached. - Past Zeta Pass the trail heads through the remaining three Carter peaks; South, Middle, and North. The grades and footing are great through this section and I was able to zoom through here with relative ease. Along this stretch there is a nice little alpine meadow south of Middle Carter, followed by a few open ledges north of Middle Carter before Mount Lethe. - The Carter-Moriah Trail has one more steep and nasty section as it descends from North Carter, mini down scrambling over boulders and broken slab that is usually wet is the highlight of the drop down to the North Carter/Imp Col.
- After navigating the tricky descent, the Carter-Moriah Trail becomes easier and I opened the pace back up as I made my way past Imp Shelter and over to the Imp/Moriah Col, where I made the last ascent of the day to Mount Moriah's summit. The trail heads over some really nice ledges on the way with great views of the Carter Range, Wild River Wilderness, and the Presidential Range. - I reached Mount Moriah's summit 4 hours and 11 minutes into the run, snapped a quick pick of the Carter and Wildcat Range to the south before making a quick descent down to Gorham, finishing 4 hours and 51 minutes after I started.